Organizing social connections based on a person’s objective “closeness” is something that comes naturally to most. The social skills that you use every day usually don’t require a second thought—we move through the day interacting with people appropriately, knowing whose hands to shake, which subjects are OK to talk about with acquaintances, who to trust with our personal information, and more. We categorize individuals and, based on previous interactions/connections, we decide how to act towards them: these decisions include how to talk to someone and what we talk about, how much we can trust them, and how much touch and what types of touch are appropriate with them. However, children on the autism spectrum, children with intellectual/developmental disabilities, and children with affective disorders have greater difficulties understanding these appropriate social boundaries, and how to categorize relationships. This difficulty inhibits children from creating healthy social relationships. Without a comprehensive knowledge of social boundaries and relationship “rules,” children on the autism spectrum are hindered from having fulfilling social interactions. Unfortunately, lacking an understanding of appropriate social boundaries also makes these students more vulnerable to physical and sexual abuse and exploitation. Circles Social Skills Utility™, is based on our best-selling Circles® Curriculum, was developed to provide these children with the tools to organize relationships and determine what levels of touch, talk, and trust are appropriate to prevent abuse and exploitation. The first installment of Circles Social Skills Utility™ focuses on touch. 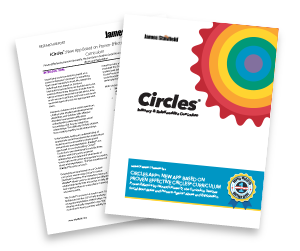 Developing an app based on our Circles® curriculum was an easy choice for James Stanfield Company. The interactive nature of Circles Social Skills Utility™ allows users to visualize the different relationship levels they encounter in daily life, and organize them in a way that is meaningful and memorable. The Circles® curriculum is used in over 10,000 facilities across the U.S to help students recognize exploitative relationships—as well as develop mutually respectful ones. The curriculum’s strong content validity has been noted by many experts in the field who have evaluated the Circles® curriculum using their professional judgment and have endorsed Circles® as an effective vehicle for teaching social boundaries and personal safety (examples below). But does a school-based program, like Circles®, actually work in teaching healthy social relationships to children with disabilities? Download & read the entire white paper research report HERE!